Learn the basics of the SQL SELECT statement in this excerpt from "SQL Queries for Mere Mortals: A Hands-On Guide to Data Manipulation in SQL, Second Edition." You'll learn how to use SELECT to access almost anything contained in a SQL database, along with the names and functions of the many clauses that compose a SELECT statement. Learn the basics of the SQL SELECT statement in this excerpt from "SQL Queries for Mere Mortals: A Hands-On Guide to Data Manipulation in SQL, Second Edition." You'll learn how to use SELECT to access almost anything contained in a SQL database, along with the names and functions of the many clauses that compose a SELECT statement. Authors John L. Viescas and Michael J. Hernandez also examine how to eliminate duplicate rows with the DISTINCT keyword and how to properly sort your data with the ORDER BY clause. If you have any comments or questions about the information presented in this book excerpt, please send an email to editor@searchsqlserver.com. Above all other keywords, SELECT truly lies at the heart of SQL. It is the cornerstone of the most powerful and complex statement within the language and the means by which you retrieve information from the tables in your database. You use SELECT in conjunction with other keywords and clauses to find and view information in an almost limitless number of ways. Nearly any question regarding who, what, where, when, or even what if and how many can be answered with SELECT. As long as you've designed your database properly and collected the appropriate data, you can get the answers you need to make sound decisions for your organization. As you'll discover when you get to Part V, Modifying Sets of Data, you'll apply many of the techniques you learn about SELECT to create UPDATE, INSERT, and DELETE statements. The SELECT operation in SQL can be broken down into three smaller operations, which we will refer to as the SELECT statement, the SELECT expression, and the SELECT query. (Breaking down the SELECT operation in this manner will make it far easier to understand and to appreciate its complexity.) Each of these operations provides its own set of keywords and clauses, providing you with the flexibility to create a final SQL statement that is appropriate for the question you want to pose to the database. As you'll learn in later chapters, you can even combine the operations in various ways to answer very complex questions. In this chapter, we'll begin our discussion of the SELECT statement and take a brief look at the SELECT query. We'll then examine the SELECT statement in more detail as we work through to Chapter 5, Getting More Than Simple Columns, and Chapter 6, Filtering Your Data. Note: In other books about relational databases, you'll sometimes see the word relation used for table, and you might encounter tuple or record for row and perhaps attribute or field for column. 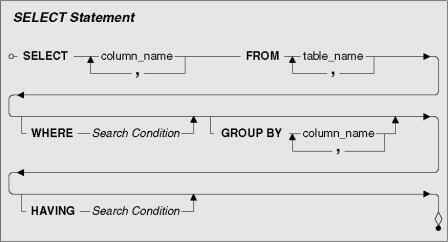 However, the SQL Standard specifically uses the terms table, row, and column to refer to these particular elements of a database structure. We'll stay consistent with the SQL Standard and use these latter three terms throughout the remainder of the book. The SELECT statement forms the basis of every question you pose to the database. When you create and execute a SELECT statement, you are querying the database. (We know it sounds a little obvious, but we want to make certain that everyone reading this starts from the same point of reference.) In fact, many RDBMS programs allow you to save a SELECT statement as a query, view, function, or stored procedure. Whenever someone says she is going to query the database, you know that she's going to execute some sort of SELECT statement. Depending on the RDBMS program, SELECT statements can be executed directly from a command line window, from an interactive Query by Example (QBE) grid, or from within a block of programming code. Regardless of how you choose to define and execute it, the syntax of the SELECT statement is always the same. Note: Many database systems provide extensions to the SQL Standard to allow you to build complex programming statements (such as If . . . Then . . . Else) in functions and stored procedures, but the specific syntax is unique to each different product. It is far beyond the scope of this book to cover even one or two of these programming languages—such as Microsoft SQL Server's Transact-SQL or Oracle's PL/SQL. You'll still use the cornerstone SELECT statement when you build functions and stored procedures for your particular database system. Throughout this book, we'll use the term view to refer to a saved SQL statement even though you might embed your SQL statement in a function or procedure. A SELECT statement is composed of several distinct keywords, known as clauses. You define a SELECT statement by using various configurations of these clauses to retrieve the information you require. Some of these clauses are required, although others are optional. Additionally, each clause has one or more keywords that represent required or optional values. These values are used by the clause to help retrieve the information requested by the SELECT statement as a whole. Figure 4–1 (on page 73) shows a diagram of the SELECT statement and its clauses. Note: The syntax diagram in Figure 4–1 reflects a rudimentary SELECT statement. We'll continue to update and modify the diagram as we introduce and work with new keywords and clauses. So for those of you who might have some previous experience with SQL statements, just be patient and bear with us for the time being. Here's a brief summary of the clauses in a SELECT statement. SELECT—This is the primary clause of the SELECT statement and is absolutely required. You use it to specify the columns you want in the result set of your query. The columns themselves are drawn from the table or view you specify in the FROM clause. (You can also draw them from several tables simultaneously, but we'll discuss this later in Part III, Working with Multiple Tables.) You can also use aggregate functions, such as Sum(HoursWorked), or mathematical expressions, such as Quantity * Price, in this clause. FROM—This is the second most important clause in the SELECT statement and is also required. You use the FROM clause to specify the tables or views from which to draw the columns you've listed in the SELECT clause. You can use this clause in more complex ways, but we'll discuss this in later chapters. WHERE—This is an optional clause that you use to filter the rows returned by the FROM clause. The WHERE keyword is followed by an expression, technically known as a predicate, that evaluates to true, false, or unknown. You can test the expression by using standard comparison operators, Boolean operators, or special operators. We'll discuss all the elements of the WHERE clause in Chapter 6. GROUP BY—When you use aggregate functions in the SELECT clause to produce summary information, you use the GROUP BY clause to divide the information into distinct groups. Your database system uses any column or list of columns following the GROUP BY keywords as grouping columns. The GROUP BY clause is optional, and we'll examine it further in Chapter 13, Grouping Data. HAVING—The HAVING clause filters the result of aggregate functions in grouped information. It is similar to the WHERE clause in that the HAVING keyword is followed by an expression that evaluates to true, false, or unknown. You can test the expression by using standard comparison operators, Boolean operators, or special operators. HAVING is also an optional clause, and we'll take a closer look at it in Chapter 14, Filtering Grouped Data. We're going to work with a very basic SELECT statement at first, so we'll focus on the SELECT and FROM clauses. We'll add the other clauses, one by one, as we work through the other chapters to build more complex SELECT statements. Before we pose the first query to the database, one thing must be perfectly clear: There is a distinct difference between data and information. In essence, data is what you store in the database, and information is what you retrieve from the database. This distinction is important for you to understand because it helps you to keep things in proper perspective. Remember that a database is designed to provide meaningful information to someone within your organization. However, the information can be provided only if the appropriate data exists in the database and if the database itself has been structured in such a way to support that information. Let's examine these terms in more detail. The values that you store in the database are data. Data is static in the sense that it remains in the same state until you modify it by some manual or automated process. Figure 4–2 shows some sample data. On the surface, this data is meaningless. For example, there is no easy way for you to determine what 89931 represents. Is it a ZIP Code? Is it a part number? Even if you know it represents a customer identification number, is it associated with Katherine Ehrlich? There's no way to know until the data is processed. After you process the data so that it is meaningful and useful when you work with it or view it, the data becomes information. Information is dynamic in that it constantly changes relative to the data stored in the database and also in its ability to be processed and presented in an unlimited number of ways. You can show information as the result of a SELECT statement, display it in a form on your computer screen, or print it on paper as a report. But the point to remember is that you must process your data in a manner that enables you to turn it into meaningful information. Figure 4–3 shows the data from the previous example transformed into information on a customer screen. This illustrates how the data can be manipulated in such a way that it is now meaningful to anyone who views it. When you work with a SELECT statement, you use its clauses to manipulate data, but the statement itself returns information. Get the picture? There's one last issue we need to address. When you execute a SELECT statement, it usually retrieves one or more rows of information—the exact number depends on how you construct the statement. These rows are collectively known as a result set, which is the term we use throughout the remainder of the book. This name makes perfect sense because you always work with sets of data whenever you use a relational database. (Remember that the relational model is based, in part, on set theory.) You can easily view the information in a result set and, in many cases, you can modify its data. But, once again, it all depends on how you construct your SELECT statement. So let's get down to business and start using the SELECT statement. This is a reasonable and a nice breakdown. Many do not get beyond the vary basics of select commands, an tend to freak out when seen in large scripts with multiple options. It's not that scary when taken apart and looked at critically :). Nice way to get your feet wet. It keeps it fairly simple and easy to grasp the concept. select * from vendor where vendor no vendor code address shipping address in vendor table.